W hite hall, NY – Dominic Felix Valastro (Dom), 90 of Whitehall, NY passed away on Sunday, December 2nd at the Slate Valley Nursing Center. 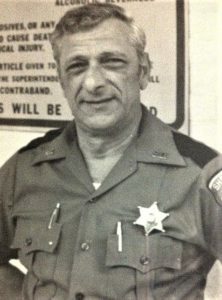 Dominic served in the United States Navy, was a longtime Whitehall Police Officer and retired from the Washington County Sherriff’s Department. Dominic was an entertainer, loved karaoke, not only did he sing and play several instruments, he was a jokester, the life of the party! He made friends everywhere he went. He was loved by everyone and he will be missed by all. Dominic is survived by his wife Dorothy Guitar Valastro. His children Richard Valastro (Machilko) of New Port Richie , FL; daughters Cynthia Terry (Mark) of Whitehall, NY and daughter Donna Williams of Suffolk, VA; step daughters Penny Potvin (William) of Inman, SC, and Lisa McMurray (Dan) of Poultney, VT; stepsons Jeffrey Parker of Glens Falls, NY and Daniel Guitar (Cody) of Murpheesboro, TN. His grandchildren Lana Van Doren (Jamie), Tina Pio (Mike), Jeanette Taylor (Mark), Brian Gosselin, Jesse Rehm (Megan), Jenny Anderson (Brad), Jeremy Terry (Shannon), Jason Terry (Leah), Valerie Terry (Jay), Katie Chapman (Andrew); Billy Potvin (Tela), Nicholas Potvin, Kyle Potvin (Chelsea), Kayle McMurray; and several great grandchildren, nieces and nephews. Siblings Joseph Valastro (Shirley), Fred Valastro (Ruth), Peter Valastro (Betty) and Patricia Berardo.